Concert music for double bass and piano only really developed into a demanding musical category in the C20th. The basis for this development was the extended sonority of the modern orchestra: the colourful, iridescent instrumentation in the scores of Mahler, R. Strauss, Schönberg and Debussy were the models for the emancipation of previously functional instrument sections. This emancipation of the various orchestra groups is best observed within the repertoire for double bass. Where the double bass had largely taken the role of supporting the harmony and structure of the classical/romantic orchestras from below, there is within newer music the ever-growing tendency not only to use the bass section as a whole in a new way, but also to give the instrument itself a leading, solistic function. The double bass was brought from the periphery of the orchestra into the centre of solo concert performance. The direct result of this was the extension of repertoire. Two factors ore further of importance in the development of independent concert literature for double bass: on the one hand it is due to the work of great instrumentalists such as Serge Koussewitzky or Franco Petracchi that the repertoire was enriched with important and demanding pieces either through their own compositions or through commissioned works. 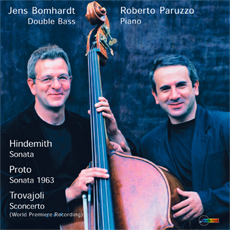 On the other hand, the extraordinary “style-setting” importance of the double bass in chamber-music jazz is not to be forgotten, today in combination with percussion and piano an important standard formation. Viewed with this music-historical background, we have stylistic, historic and sound elements, which in different ways have influenced the three works on this CD.